15 customers were able to try this promotional product before it sold out at 1:00 PM on December 14. The regular, guaranteed lowest price on 25 of these totes would be $329 with set-up, SAVE $100! Logo'd tote bags bode well for your brand! 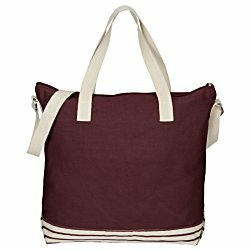 Tote bags are made from 10-oz, 100% cotton canvas for long-lasting use. Store a variety of different items inside the large, zippered main compartment. 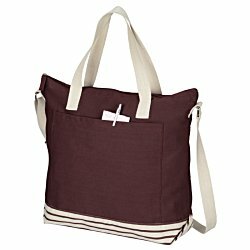 Totes also include a front slip pocket and an interior zipper pocket. Includes an adjustable shoulder strap and carrying handles for easier transport. Bags are designed with a colored body and a stripe-patterned base. Logo'd tote bags carry your belongings and your brand’s message! Size: 16" x 16-1/4" x 5-3/8". 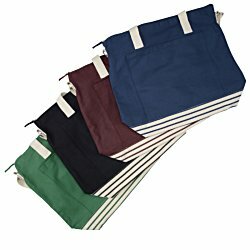 Your price includes a one color imprint on the front center pocket of the tote.